Pretty soon I realized what I was actually doing. Besides letting some of my plants die slow deaths of neglect (see my sparse little fern on the shelf above who is now trying to resuscitate himself from my accidental neglect? ), I felt I could justify skipping some daily tasks for awhile until I wasn’t as busy, or even until we “finished” this room or that. But while it felt like I was giving myself time to do other things, what I was really doing was depriving myself of the joy of puttering around my house right now! The result of skipping tasks or not savoring the small practical details of daily living was that I actually felt more overwhelmed, not less. 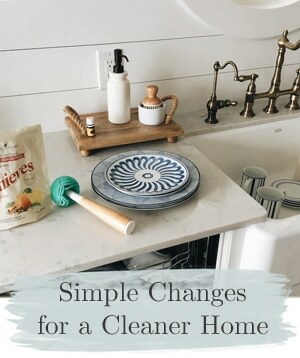 While I knew I’d feel extra happy to clean when I had a shiny new farmhouse sink (for instance) I am not always as excited to clean the old one I have right now. Womp womp womp. It sounds awful to say because I should really just be grateful I have a sink at all. And I am grateful, I just need to remind myself of the purpose of a clean sink every now and then. 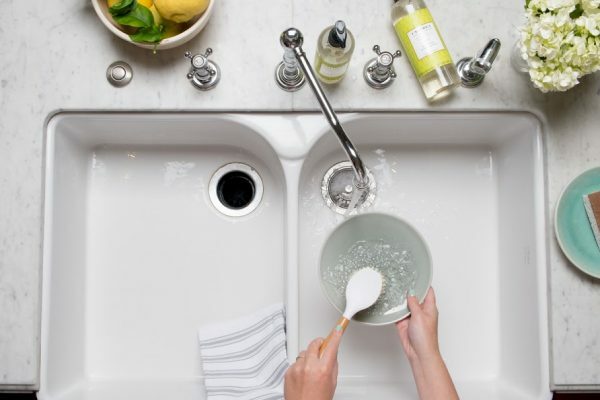 If you have a shiny new sink, you know how lovely it looks after you polish it clean. 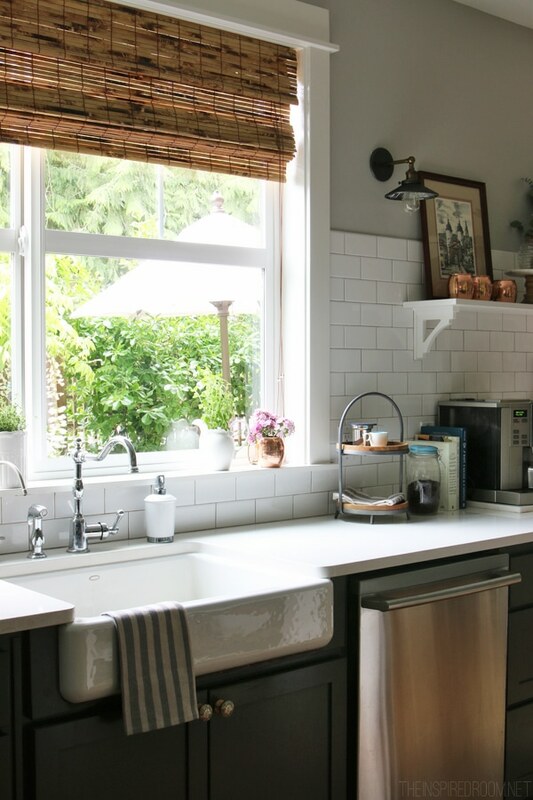 A shiny sink is the cherry on top of a beautiful kitchen! Cleaning an old one may not give you quite the same result, but the alternative is a sink full of dirty dishes and that is never pretty. 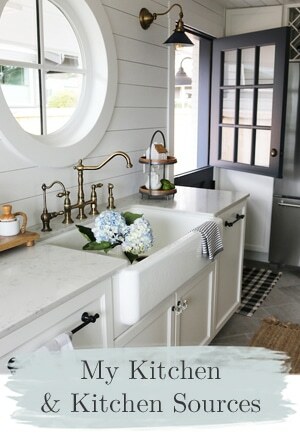 Click here for my tips and secrets for cleaning a white sink without harsh chemicals! I know it’s hard to keep up with a house. Trust me, even though my kids are older now (it will happen before you know it) I not only remember vividly how messy a house gets when kids are small, but even now my house gets messy. 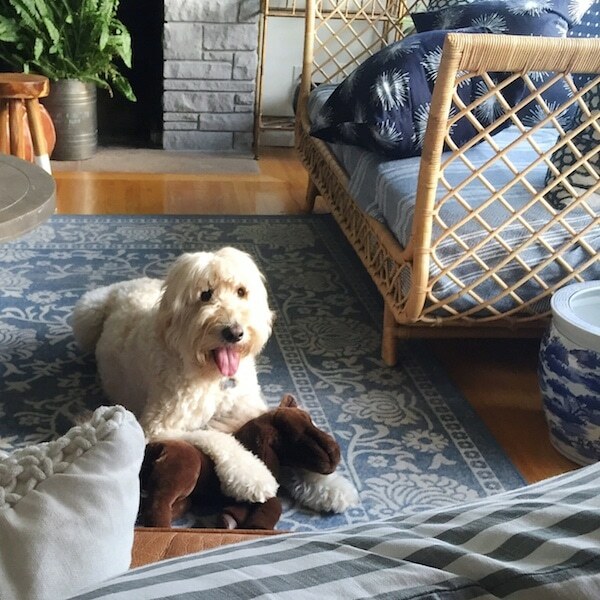 Besides our own stuff that seems to multiply everywhere, Jack thinks of this room as his personal puppy playground. He is aways tossing the pillows on the floor and skinning the fur off his toys until the stuffing goes everywhere. Even when I do want to clean the house, he’s right there to mess it up again. He is pretty much like a toddler in his mess making ability, but not quite as demanding in other ways. But he makes life fun and of course your kids do, too :). 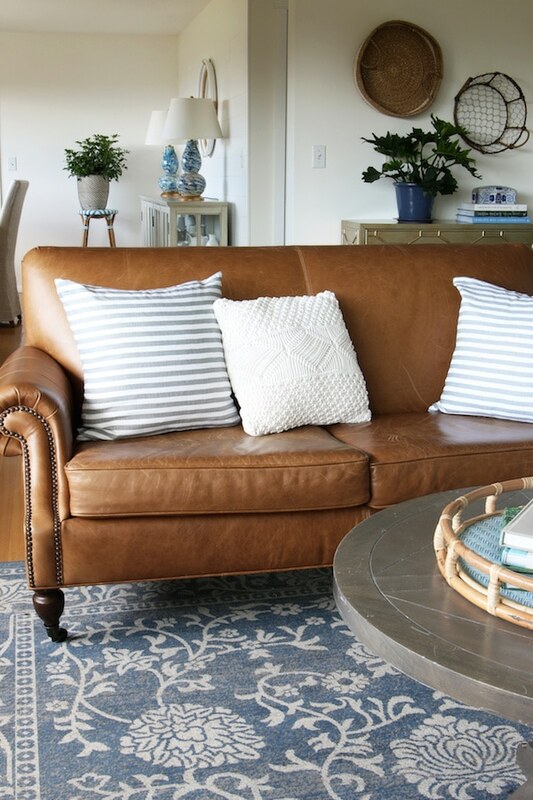 Cultivating a love for a clean (enough) house (whatever house you’re in right now) takes some practice and intentional effort, but it’s worth it when you see the rewards of that daily rhythm. 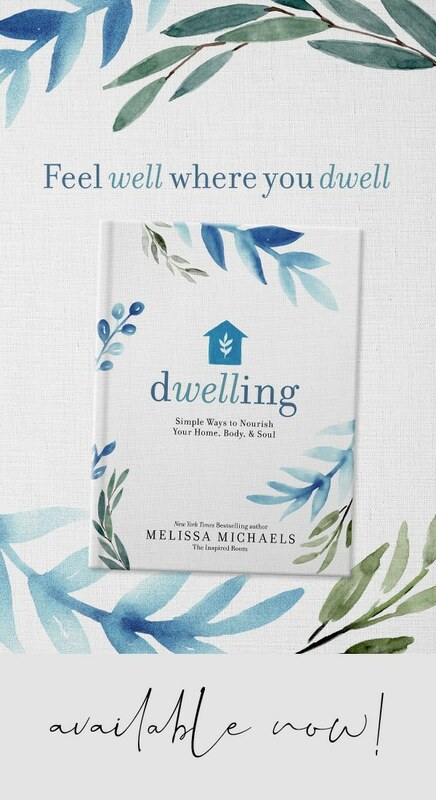 Whether you are in a home-slump from a move or transition or fatigue or just stinkin’ thinkin’ for whatever reason, it’s important for your sanity and joy to gently revive your nesting instincts as soon as you are able. Yes, you can nurture those instincts. I have to do it and I bet you do too, sometimes. 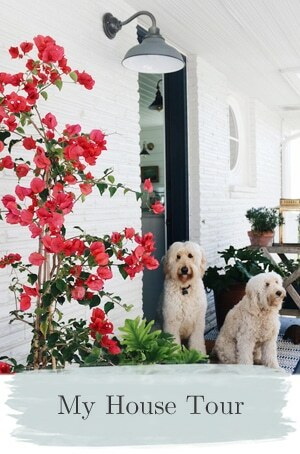 We may not always feel like cleaning or taking care of a house, but many times a slump can be short lived if we can train or retrain ourselves to enjoy home-keeping. Speaking of nesting, do you remember fall nesting? If you’ve been around for awhile I hope you remember it :). I’m reviving my most loved series this fall! YES, FALL NESTING WILL RETURN! I think last year I was so busy with our move and book writing that I just couldn’t muster my energy for it. SOMETIMES SLUMPS ARE A THING. But this year I am ready to get back to nurturing the nest. I hope you’ll join me? Would you cheer me on and even be cheered on? I miss our bonding and kindred chats over all things fall nesting so I’m really excited for fall this year. So, do you ever get in that stinkin’ thinking cycle I mentioned yesterday? Today I thought I’d share 5 ways I try to overcome it to get us back on track. Stick to the non-negotiables. If I let myself make even one excuse, it’s a downward spiral of stink. 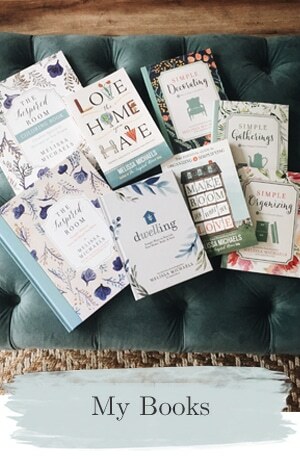 I’ve written about my routines and housekeeping methods in my books Love the Home You Have and in Make Room for What You Love, if you need more encouragement for cultivating successful daily habits. Tune into the tunes. Music always inspires me to clean. It’s like it flips a switch in my head from thinking up excuses and tells me it’s time to get into the groove, so to speak :). Savor the scents. In order to make daily cleaning something I look forward to, I have to enjoy the process of making my house smell better. Giving myself the gift of good smelling (and healthier) products***, fresh sheets and a clean house changes how I feel about my home. Savoring what clean smells like inspires me to get through my housekeeping chores. Reward your efforts. It works in kindergarten and it works in adulting, too. What will be your “gold star” as soon as you do the dishes? Finish the task with a reward that is tied to the completion of the project, something as simple as lighting a candle or hanging a fresh dish towel on a hook can be just the pat on the back you need. Remember, pretty is as pretty does. My grandma always used to quote that little phrase and it stuck with me. 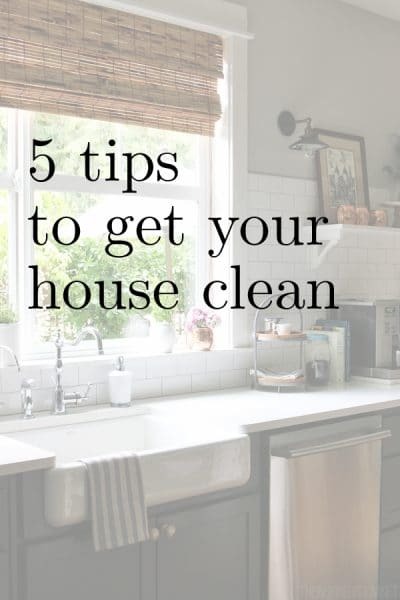 While it doesn’t necessarily apply to this situation in the exact way as it was originally intended, cleaning your home isn’t just about improving appearances. Focus on how your day, perspective and mood will improve once you’ve polished the sink and put away clean laundry. 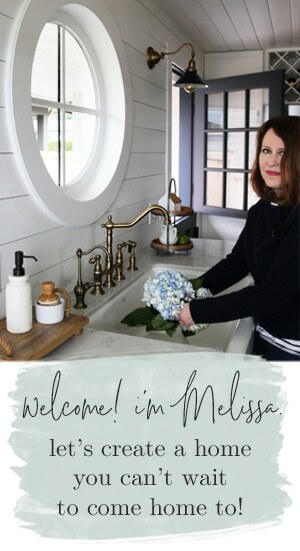 ***Get my favorite plant-based household cleaner and the essential oils I LOVE for wellness and scenting my home here! Update! Everyone who has or will take advantage of this deal through my link (EXTENDED THROUGH TUESDAY!) will also receive a FREE COPY of my book THE INSPIRED ROOM! Seriously. Have you ever made excuses for why your house is a mess? I have. Trust me. Of course, there are some days or circumstances where you really can’t or shouldn’t clean. Don’t beat yourself up over legitimate reasons and seasons. But most of the time, ignoring or postponing housework that really needs to be done now or making excuses for why we aren’t giving our home the TLC it deserves (and we deserve!) is just stinkin‘ thinkin‘. When your house is dusty, it stinks. When your sheets aren’t fresh and clean, they stink. When your sink is dirty, it stinks. When last night’s dishes are piled high on the counter, your kitchen stinks. When you haven’t cleaned out the fridge and a bowl of black beans has been sitting in there for four weeks, EVERYTHING stinks. When our house stinks, we are unhappy. We feel stressed out. Am I right? The stinkin‘ cycle of a messy house will never end if we keep making excuses and don’t stop the madness! That’s why I have had to be committed to kicking housekeeping excuses to the curb. Making my house smell GOOD is one of the best motivators and rewards for cleaning. 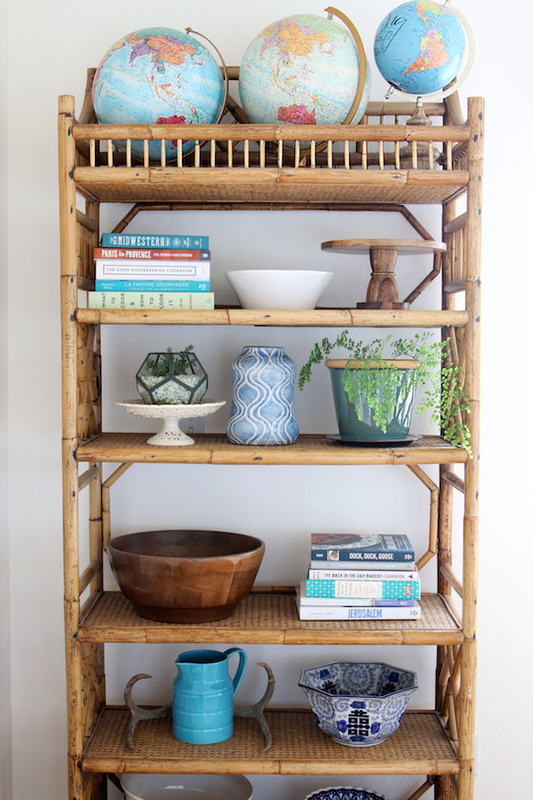 I have some more great tips for getting inspired to do housework and even enjoying it (I know I need all the inspiration I can get, so click on the link to find that post). Since this freebie is only offered for a LIMITED TIME and quantity, I wanted to make sure YOU, my favorite reader :), got in on this deal right now because it is TOO GOOD TO MISS! If you haven’t yet heard of Grove Collaborative, I absolutely know you will love it as much as I do. 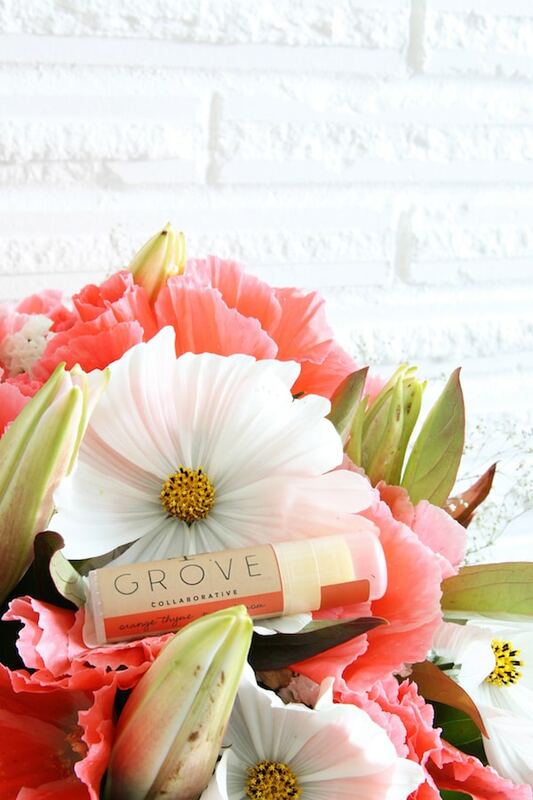 Grove curates the best natural household products and delivers whatever you select and need right to your door, on your schedule. It has been a lifesaver for me. I have several subscription type services now that save me time and money and I’m 100% committed on saving both as often as possible. 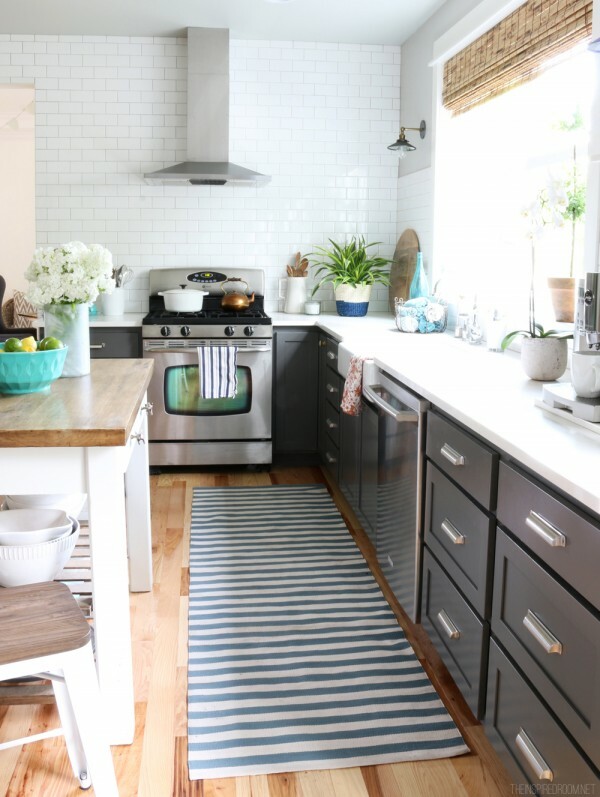 With Grove I stay stocked on the basic products I love and use everyday even occasionally order fun new things like fresh and pretty dish towels so I always feel prepared for entertaining. There’s no longterm obligation whatsoever, but if you sign up for this deal as a new customer you’ll receive three items I love for FREE. Check them out, all the details are below. Trust me, it’s an amazing deal. For first time Grove Collaborative members, click this link here to sign up. You’ll receive the Caldrea Luxury Set for free when you sign up and spend $20 or more on your first order (order whatever you want or need anyway). Confirm that your order reaches at least $20 to receive this offer. That’s easy to do because Grove offers so many products you love and use everyday. I mean, honestly, what’s not to love about this deal? I LOVE all of these free products and use every single one of them at my house. 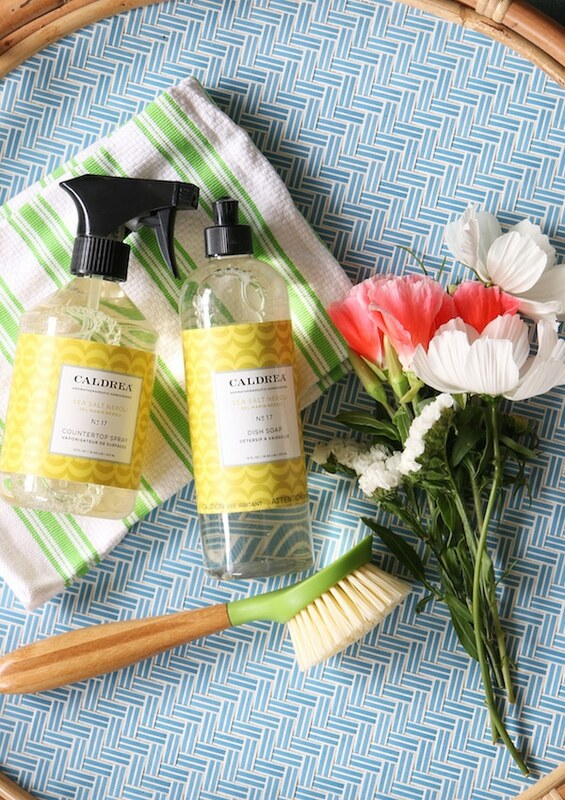 Caldrea’s dish soaps and countertop cleaners are totally adorable (a must in my book! ), but what’s inside is even better. 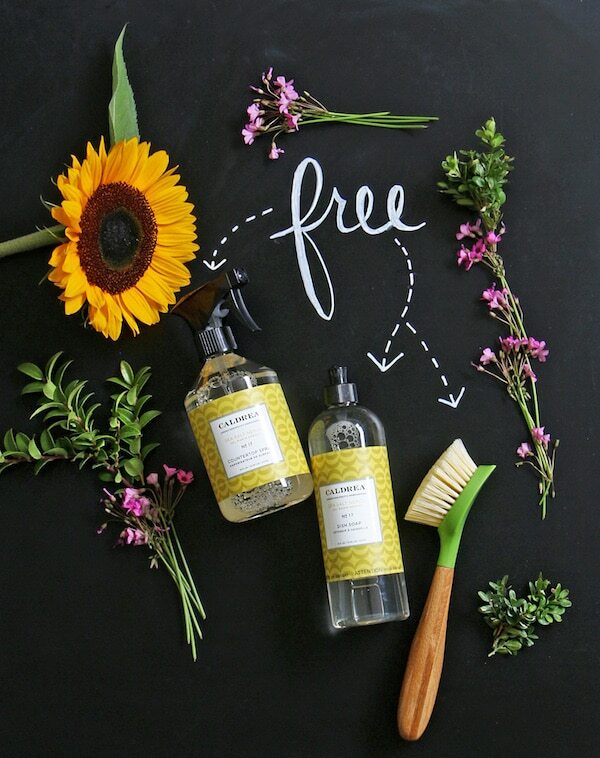 They’re made with safe, non-toxic ingredients, and the cleaning power is hands down the best. They also make a great hostess gift, so I love keeping some extras on hand. You can choose from four light, summery scents for your freebies: ginger pomelo, sea salt neroli, pear blossom agave, and tangelo palm frond. All are SO GOOD. It’s hard to pick a favorite, but I’m loving the sea salt neroli right now. I’m obsessed with good scents so I know what I’m talking about. This is the good stuff. The Grove Collaborative Be Good dish brush is thoughtfully made with BPA-free recycled plastic and bamboo. This orange thyme and cardamom lip balm is new to me this month, but now I will never be without it. It smells SO GOOD and feels great on your lips, too! Above you’ll find a sample of what you could order, the savings are incredible! Current customer bonus: If you already use and love Grove, there’s something free for you, too! You’ll get the Grove Collaborative Be Good Dish Brush when you place your order using this link here for existing customers only. Let me know what products and scents you decide to try! You are going to love Grove Collaborative! Disclosure: compensated links are used in this post.